Top Shades reduce glare, heat, and UV radiation by up to 65%. You'll be wondering why you didn't buy this years ago. You stay cooler, your air conditioning runs less, and your interior is less susceptible to fading. Precision, die-cut matrix film stays in place with powerful "static cling", and you retain the see-through effect of your factory tops. Applies or removes in seconds to any clean, dry, smooth surface. No fasteners, just smooth on with damp cloth and go. 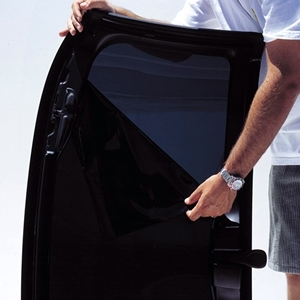 Q: is there a solid shade for inside of my targa top?